I’m often amused at how the world works. A few weeks ago I tweeted, asking where I could find kimchi in Cape Town. I first tasted the Korean vegetable dish at Tokara last year. It had the most incredible tarty, pickled sweet taste and complimented the meat perfectly. My kimchi prayer was answered when Kelly Schreuder, a Cape Town dietician replied to my tweet and offered to make me some! I was so touched by Kelly’s gesture that I asked her if she would consider doing a guest post. To my delight she obliged. We met up at &Union last night for the exchange of the magical jar of kimchi and ended up having a LOT to talk about. So without further ado, Kelly – take it away! 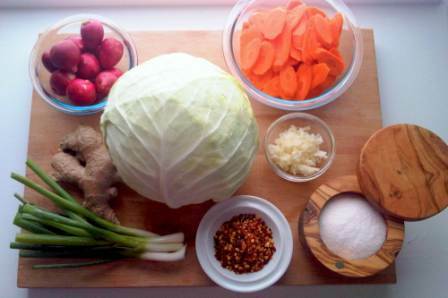 – Making kimchi is one of the most satisfying culinary experiences you’ll ever have, I promise! It is easy and delicious and it takes very little time to make enough to last a few weeks or months, but has the same feel as something like gardening, or making marmalade with your grandmother – an old-world tradition or ritual where you just know that the benefits are far greater than the material results – and the best part is that it is really good for you too. Kimchi is a Korean pickle or condiment made with cabbage as a base. Honestly I do not know much about the real Korean culture behind kimchi. I say that because I have never been to Korea and watched people make and eat it there, so I am no authority on those details. 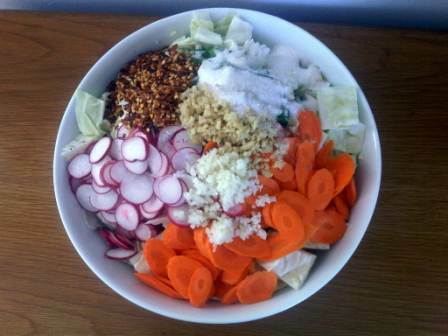 It was first introduced to me by Andrea Potter (a holistic nutritionist and chef ) when I lived in Vancouver in 2010 and the first time I tried it was the batch of homemade kimchi given to me by Kari – a friend of mine from culinary school. For the uninitiated, kimchi is a delicious spicy pickle with the distinctive “Asian” character that comes from ingredients like chilli, ginger, spring onions and garlic. In the same way that a slice of pickle completes a burger, kimchi completes my noodles, miso soup, rice paper spring rolls, grilled fish, stir fry and anything else that I think needs a bit of life. Kimchi is made by natural fermentation in a salty brine, so the vinegary acidity that you taste in the final product is not added, it is actually a by-product of lactic acid fermentation by the same probiotic bacteria that make yoghurt. Fresh kimchi (before fermentation) just tastes like salty, spicy coleslaw and it is left for a few days to allow the bacteria to work their magic. Apart from being a source of probiotics, the fermentation process also results in higher levels of antioxidants such as vitamin C. There has been a study that showed the addition of fermented kimchi to the daily diet of 100 Korean men was associated with improvements in cholesterol levels, carbohydrate metabolism and weight loss. The extra fibre from the vegetables and the potential metabolic-boosting effects of the chilli add to the appeal from a health perspective. The role of pickles is also to stimulate saliva production, which, along with the healthy bacteria, aids the digestion of whatever else is eaten with that meal. The saltiness is the only downside to kimchi, so those with blood pressure concerns should be cautious about how much they eat. There is usually no need to add extra salt to a meal when you are eating kimchi. Korean kimchi is made with Napa cabbage and daikon (a large white radish), both of which are difficult to find here in South Africa. I use local ingredients where possible, so the result is not traditional (the small red radishes we use are much hotter than daikon), but it is pretty close and it makes more sense to me to use what is available here. I chose to leave out ingredients like dried shrimp and fish sauce, so the version I make is raw, vegan and slightly less pungent than it would be with the shrimp. 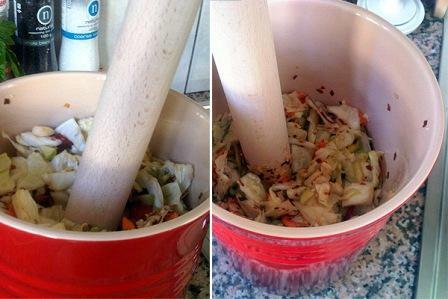 2 kg cabbage – you do not need to weigh this before, just adjust the salt quantity if you have more or less cabbage. Use approximately 1 tablespoon of sea salt per ½ kg cabbage. – Large bowl and/or ceramic or glass container for mixing and storage. I used a Le Creuset storage container. Do not use metallic containers. OPTIONAL: Something to help with the initial breakdown of the cabbage in case you get tired of using your hands. I used a wooden rolling pin without handles to help with the “pounding” of the ingredients to draw more water out of them. OPTIONAL: food processor for making a spice paste. This is traditional, but not essential – you still get a good result if you just finely chop the ginger the garlic. Items for weighing down the ingredients during fermentation so they are always covered in the brine. I used a plate and a kilogram bag of salt as a weight. 1) Rinse all the vegetables. 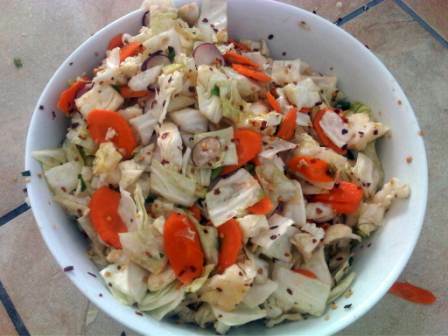 Chop cabbage into bite-sized pieces, and slice the radishes and carrots. Julienne the apple and slice the spring onions. 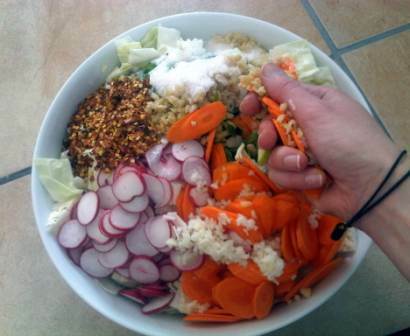 Put all the prepared vegetables into the large bowl/container. 2) You can either use a food processor to make a paste with the garlic, ginger and chilli first, or you can just finely chop those ingredients and add them to the vegetables. 3) Add the salt and then use your hands to mix all the ingredients together. You have to work at squeezing everything and mixing vigorously for about 5 minutes to get the vegetables to release fluid. I use my hands at first to distribute the ingredients evenly and then I pound them with a wooden rolling pin for a few minutes to help to break them down further. 4) Taste the mixture – it should be pleasantly salty. If it does not taste salty like a pickle, add an extra pinch of salt until it tastes right. 5) When you can see some fluid is released, pack the vegetables neatly and weigh them down. They might not be fully covered at first, but check on them after about an hour or two and you will notice the water level rise as the salt draws more fluid out. 6) Cover the top of the container loosely with a cloth to prevent anything from getting inside, but not with a tight-fitting lid – you want carbon dioxide to escape. 7) Leave the jar on the counter for 2-5 days and taste it every day to see how it changes. You can leave it there for 2 weeks or more if you want a full fermentation and maximum benefits, but the first time you try this you might prefer a fresher taste. If the kimchi goes bad you will know immediately because it will look, smell or taste really terrible, so don’t worry, you will notice! If that happens, just throw it out and try again. 8) Once the kimchi has reached a stage of pickling that you like, you can transfer it to the fridge, either in the same container with a lid, or into closed glass jars, where it will keep for several months. 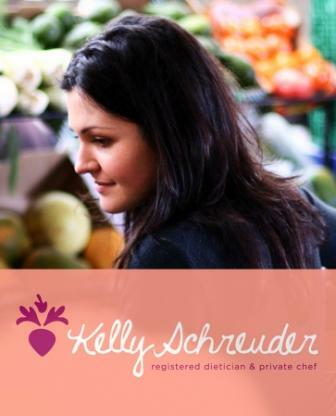 Combining her dietetics and professional culinary backgrounds, Kelly has a deep understanding of how to use food to enhance health and get the most from your body. She runs her dietetics practice at the Velocity Sports Lab in Hout Bay, Cape Town, and offers private or group cooking demonstrations. My one editor dubbed last month ‘Sober October‘ (i.e no drinking for the month). But after convincing her that it was a bad idea and an enterprise doomed to fail, we changed it to ‘No-hangover October‘. This was unquestionably more successful and I think she’s glad she made the switch! Now that we’ve entered a new month, and are hurtling towards Summer at full speed, we’re calling November ‘Slender November‘. Nobody wants to set foot on Clifton looking like a beached whale and so we’re trying to gently lower our calorie intake by skipping the morning muffins and saying no to our mid-afternoon chocolate binges. Instead we are gorging on healthy salads chock-full of veggies, crunchy nuts and lots of chicken and fish. That all sounds easy, you may say… but honestly – it’s definitely not. Not when you get deliveries of beer bread mixes, and salted caramel Rice Krispie treats and marshmallow pops and, and and! It never ends. Thankfully though, when we were invited to the launch of Col’Cacchio‘s new pizza range – Pizza Foro, our heart skipped a beat. 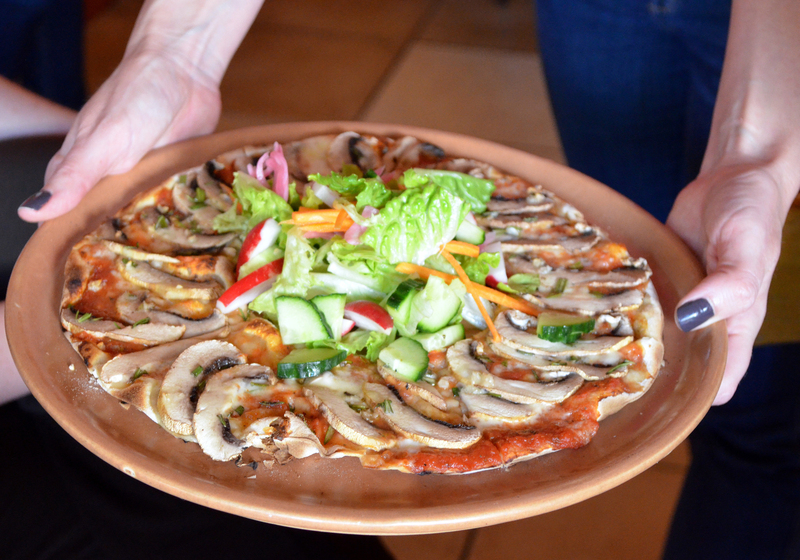 Because in true Col’Cacchio we-like-to-be-different style, the restaurant chain has been so clever and brought out their version of a ‘skinny pizza’. I kid you not! These people totally get us. The whole thing weighs in at roughly 500 calories. I must have had about 3 or 4 slices of pizza and then conceded to join a friend for a 10Km run. 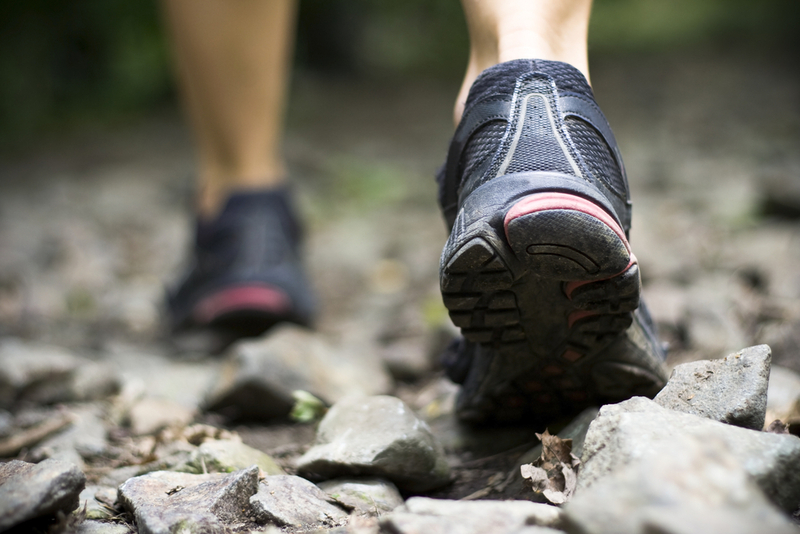 No bloating.No feeling lethargic.No nothing. 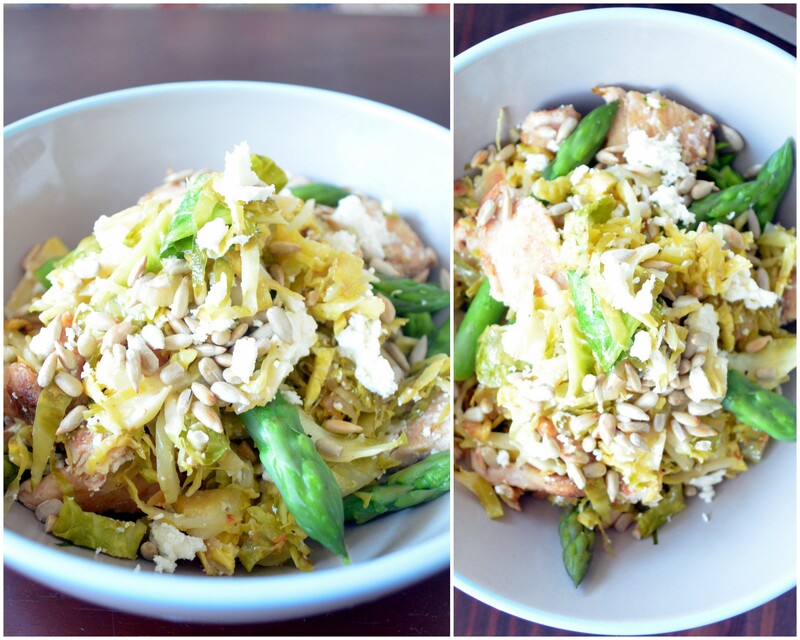 Asparagus, brussels sprouts and goat’s cheese salad. Besides yesterday being the day after a public holiday where everyone in the office displays symptoms of repletion in one form or another, it was also the first day that I felt brave enough to sport the short summer dress to work. Oh yes, it happened! There’s something about wearing anything above the knee for the first time after Winter that makes one feel so exposed! I won’t lie that it actually felt pretty amazing and I cannot wait to spend days in light cotton frocks and pretty sandals, eating summery salads and sipping spritzers. I’ve been slowly easing my way out of the ‘soup-for-lunch’ routine that’s kept me going throughout the chilly season, but now it’s time that the salad phase kicks in. and fast! I’ve had a packet of little asparagus tips in the fridge that I’ve been meaning to use (Besides for the smell of Jasmine in the air, I always know Spring is here when I catch a glimpse of asparagus on the shelves at a reasonable price!). It made it’s way into this light Spring salad that’s definitely going to be part of my work-lunch repertoire for the next while. My best though is the brussels sprouts and toasted sunflower seeds that lend a super crunchy texture. Add a chicken breast or two for protein and you’re good to go! Blanch the asparagus tips in salted boiling water for 2- 3 minutes and refresh under ice cold water. Set aside. In a non-stick frying pan, sauté the onion on medium-high heat until it gets sweet and ‘charry’, then add the brussels sprouts and cook, tossing often. Add the red wine vinegar and let it reduce. Season with salt and pepper. Once the brussels sprouts are cooked and have developed some colour, remove from the heat and set aside. Cut the chicken breasts into small slices and cook in the same pan. Set aside to cool. In the meantime add the lemon zest to the brussels sprouts and a light drizzle of olive oil to coat. Once all ingredients are cooled, add the chicken pieces and asparagus and then crumble in the goat’s cheese. Top with the toasted sunflower seeds and an extra grinding of black pepper. Do you ever get the craving for something crispy and crunchy and deliciously salty? So do I but the truth is I don’t enjoy snacking on chips or crisps because if I have one, I must have a million and then it becomes everything but a snack… do you see where I’m going with this? I’m happy to say I’ve now found a nice, healthy substitute for the addictive little morsels. 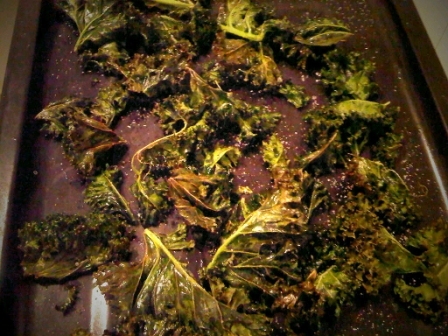 One of my favourite local Cape Town bloggers, Emma Jude, posted a recipe for kale chips a few weeks ago and I decided to give them a try after remembering that I actually had some kale on hand in my fridge. They came out well, I think! Extremely crunchy and ‘chip-like’, and MUCH more delicious than they look! There are literally 12 days until Knysna and I’m getting really excited!! If I think back on how much fun I had last time… I know that it’s going to be a jol of note! In all honesty I know I could be better prepared race-wise.. I just haven’t had the luxury of sunlight that would enable me to get in decent mileage (I refuse to run in the dark and the boredom levels that come with running over 8Km on a treadmill… oh my gosh, I’m not even going to talk about it! Bleh!). I’m not worried that I won’t finish but I’m being realistic and know I won’t clock a Sub-2. It is what it is. Now, let me just announce that I’ve never been to the Northern Cape so it would be a great opportunity to explore that part of the country. The race itself has me feeling a little anxious, especially after reading the email and watching this.. But I was talking to my friend Pips the other day and we are both dying to do something physically challenging and this seems to fit the bill perfectly. A weekend away with friends, camping out in the middle of nowhere (I would never in a million years classify myself as ‘a camper’ but that’s all part of the challenge, don’t you think? 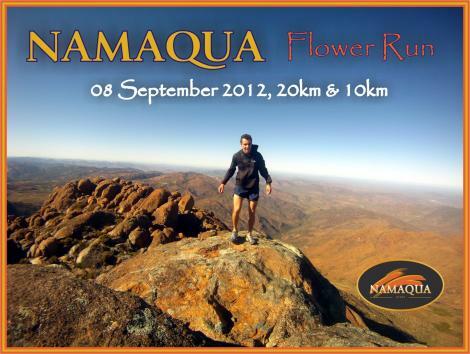 ), and summiting the highest peak in the Northern Cape. Sounds like fun right … right??! I’ve bitten the bullet and entered the 20Km. Uh….let’s talk about that another time! This weekend was filled with wine, pizza, running, brunching and reading. In a nutshell- all the things I ♥ ! An added bonus was that I didn’t have to haul out my raincoat once!! Yesterday was especially beautiful. Bright, sunny and warm with a hint of winter dryness in the air. I met Sierra for a long run through the vineyards in Constantia. According to her Garmin we covered 11 miles (which after a quick calculation, equates to 17.7km). 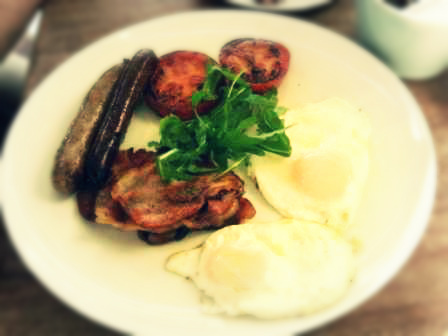 A delicious breakfast was inhaled consumed soon afterwards at Tashas. It was my first visit to the Cape Town branch but I’ve eaten at the one in Gateway twice. My thoughts? Love it ! We got there at peak Sunday brunch hour so not surprisingly the place was heaving. Heady wafts of coffee and intoxicating smells of baked goods emerging from the kitchen had me telepathically thanking Sierra for the post-run breakfast suggestion! We were seated outside which was perfect as we were able to catch some sunny rays and merge into the bustling, chatty atmosphere. Plus it offered great opportunity for people-watching! We ordered drinks from our friendly and highly competent waiter who displayed a great sense of hospitality and provided top-notch service throughout the meal. 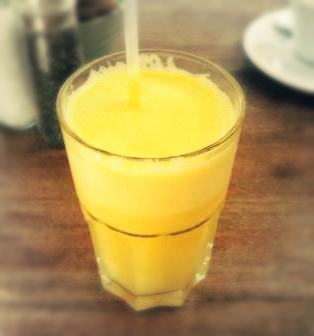 I normally would’ve slammed him with a coffee order but the thought of freshly squeezed orange juice made my thirst-quenching glands (are there even such things??!) tingle! I’m so glad I ordered this because it was amazing!!!! Anything citrus for me in winter = heaven! 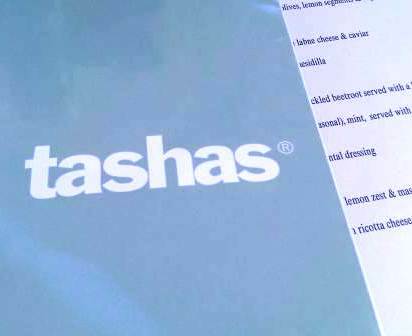 Now, if you’ve been to Tashas, you’ll know that the menu is rather extensive! And if you’re as indecisive as me…well, you’re in for a pretty tough time because there are so many amazing sounding dishes from which to make your choice. 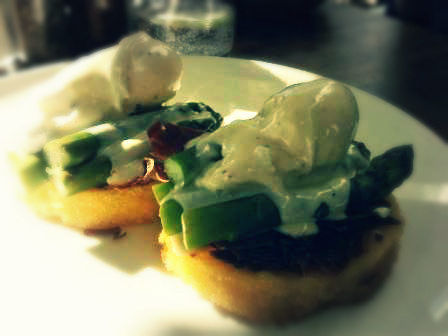 After going back and forth, and back and forth and back again, I finally decided upon the Breakfast Royale from the ‘Healthy appetite’ section – 2 poached eggs on asparagus spears, topped with a light lemon sauce, served with crispy Pama ham (optional) and a choice of health bread or polenta toast. I was really happy with this choice. It totally hit the spot! My eggs were poached to perfection (for me) although I noticed they serve very small eggs! Hmmmm… They were enveloped in a sauce that was smooth and velvety and very ‘light and lemon’- staying true to the menu description. The eggs were perched atop a layer of blanched asparagus spears and some salty and crisp Pama ham which provided a nice meaty contrast. 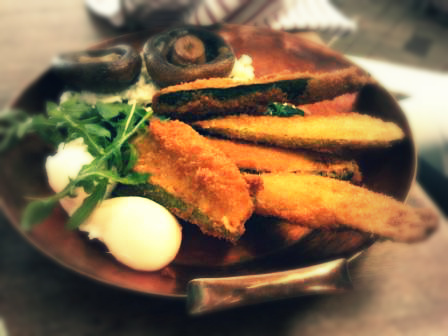 I chose the polenta toast which was the base of the dish. The texture was spot on being creamy on the inside and crunchy on the outside. The only disappointment was that the polenta itself was rather under-seasoned so I had to hike it up with a lot of salt! Sierra’s husband, Lennie – who met us at Tashas, had a version of the ‘classic’ breakfast which also looked deliciously appetizing. I will definitely be making a plan to go back to try a few of their lunch options!